Icelandic graphic designer María Rut Dýrfjörð's Hidden World pattern collection references the work of the country's former state architect Guðjón Samúelsson. Samúelsson designed some of Iceland's most notable buildings including the National Theatre, Hallgrímskirkja church, the church of Akureyri, Héraðsskólinn á Laugarvatni and the church of Laugarnes. "Guðjón's buildings are in precise style, stately and formal," said Dýrfjörð. "I connect them with patternmaking and my own passion for order and organisation. Shapes that are mirrored and repeated, lines that stretch on, brake and connect. All this forms a beautiful whole without being predictable." "In the concrete I can picture a clear connection to the nature; the mountains, rocks and vastness," the designer continued. "Like Guðjón I see in them wonderful and magnificent beauty, I see in them the homes of the Hidden People." The Hidden People or Huldufólk in Icelandic – Huldu refers to secrecy and fólk means people or folk – are believed to live in the rocks and mountains of Iceland where Guðjón sought inspiration. Her Hulduheimur (Hidden World) range consists of six patterns. Stuðlar and Strengir prints are influenced by the Churck of Akureyri, located in Dýrfjörð's home town. "The church front is symmetrical and its form is very consistent, something that appeals to my way of style as I am drawn to order and linear forms," she said. The columns of a similar church in Laugarnes formed the base for the Drangar pattern. The National Theater building in Reykjavík provided the starting point for Álfhóll. "Here in Iceland the history of architecture is very young and the National Theater building in my mind is our nation's first palace or castle," said Dýrfjörð. Hamar is inspired by a set of buildings designed for the Bank of Iceland and Brot takes shapes from the old school house at Lake Laugarvatn. Each pattern is available in two colour palettes. Muted Colors of Grey features tones taken from Samúelsson's architecture, while Splendor of Colors includes a range of complimentary pastel shades. Although designed for textiles, the patterns are suitable for other surfaces such as wall paper, rugs or weaving. 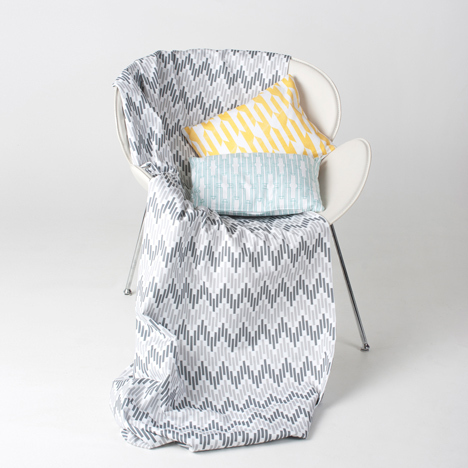 So far the patterns have been digitally printed on cotton twill and promoted as fabric and decorative pillows. Four have also been printed on gift wrapping paper and Dýrfjörð hopes to expand the product range by adding bedding sets. The collection debuted during Reykjavík's Design March festival earlier this year, where Thorunn Hannesdottir launched air of tables topped with concrete and aluminium.